How to Make a Flower Ribbons ~ DIY Tutorial Ideas! 1. Materials: Two 2.5cm Wide Ribbons (apricot pink and navy blue, each for 75cm long, you can reserve more), Three 0.6cm wide Ribbons (black, navy blue and brown each for 40cm long), One piece of Glass Yarn (10cmx40cm), A beautiful Wedding Photo (for a right size), Needle and Thread, A small piece of Nonwoven Fabric, Retro Receptacle, Gem Glue Patch fits for the size of receptacle, Some Transparent Flat Bottom Diamonds, Two Brooch Cares, AB Glue, Hot Melt Glue and Glue Guns. 2. Mixed right amount AB Glue in the bottle cap, and wipe it at the bottom of Gem Glue Patch. Glue it onto the photo, press it to discharge the bubbles, and dry it for 24 hours. 3. Cut out the well dried gem pathces, and stick it to the receptacle if you have. 4. Cut the 2.5cm wide ribbon into 15 pieces, each for 5cm long. Don't forget to use lighter to burn the edges to prevent to take off the line. 5. Fold down the left and right sides of the ribbon as the figure shows. 6. Fold the two corners to the midline, and in the bottom flat seam. 7. Repeat the step6 and string the 15 ribbons together. You should proper tension suture and knot. 8. Drop a little hot melt adhesive on each ribbon petals, and make a sharp corner. 9. Roll the petals from one side, and drop hot melt adhesive at the edge of each piece. You will find it comes to be a flower. 10. Navy blue flowers do the same thing, and glue the gem patch to the flower heart. 11. Glue some diamonds at the bottom of the 0.6cm wide ribbon as you like. 12. The short edges of glass yarn folded in half and the tow long sides plain stitch, and it can be properly widen. 13. Tighten the line and sew up, link the layup with roll sewing. Try to make it nicer. 14. Sew the apricot pink flower onto the glass yam flower. 15. 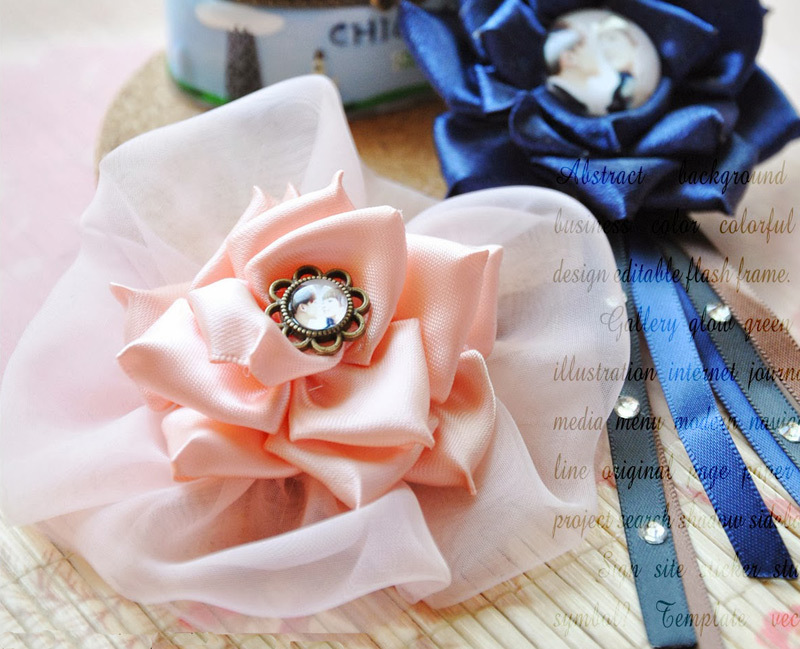 Fold the three 0.6cm wide ribbons and glue them to the back of the navy blue flower. Cut the nonwoven into wafers, which should be sticked to the brooch cares. And same to the pink one. 16. Now you got it!